We do not live in a post-truth world and never have. On the contrary, we live in a pre-truth world where the truth has yet to arrive. As one of the primary currencies of politics, lies have a long history in the United States. For instance, state sponsored lies played a crucial ideological role in pushing the US into wars in Vietnam, Iraq, and Afghanistan, legitimated the use of Torture under the Bush administration, and covered up the crimes of the financial elite in producing the economic crisis of 2008. Under Trump, lying has become a rhetorical gimmick in which everything that matters politically is denied, reason loses its power for informed judgments, and language serves to infantilize and depoliticize as it offers no room for individuals to translate private troubles into broader systemic considerations. While questions about truth have always been problematic among politicians and the wider public, both groups gave lip service to the assumption that the search for truth and respect for its diverse methods of validation were based on the shared belief that “truth is distinct from falsehood; and that, in the end, we can tell the difference and that difference matters.” It certainly appeared to matter in democracy, particularly when it became imperative to be able to distinguish, however difficult, between facts and fiction, reliable knowledge and falsehoods, and good and evil. That however no longer appears to be the case. In the current historical moment, the boundaries between truth and fiction are disappearing, giving way to a culture of lies, immediacy, consumerism, falsehoods, and the demonization of those considered disposable. Under such circumstances, civic culture withers and politics collapses into the personal. At the same time, pleasure is harnessed to a culture of corruption and cruelty, language operates in the service of violence, and the boundaries of the unthinkable become normalized. How else to explain President Trump’s strategy of separating babies and young children from their undocumented immigrant parents in order to incarcerate them in Texas in what some reporters have called cages. 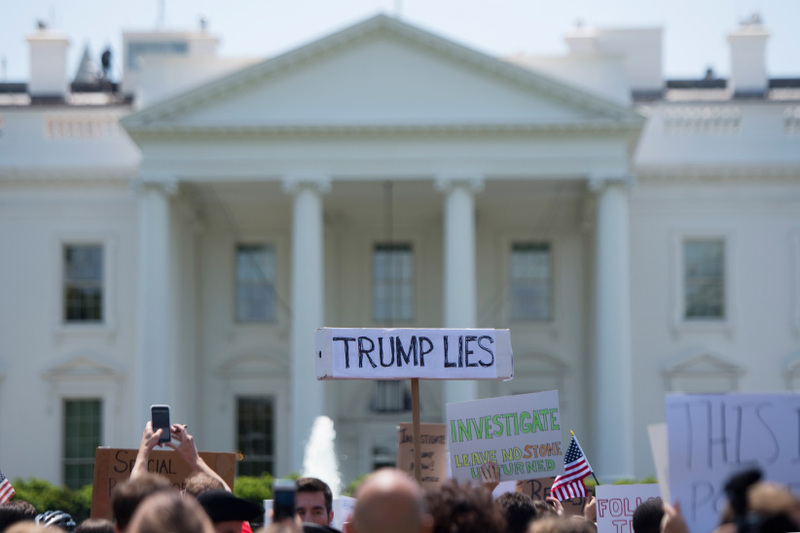 Trump’s misleading rhetoric is used not only to cover up the brutality of oppressive political and economic policies, but also to resurrect the mobilizing passions of fascism that have emerged in an unceasing stream of hate, bigotry and militarism. Trump’s indifference to the boundaries between truth and falsehoods reflects not only a deep-seated anti-intellectualism, it also points to his willingness to judge any appeal to the truth as inseparable from an unquestioned individual and group loyalty on the part of his followers. As self-defined sole bearer of truth, Trump disdains reasoned judgment and evidence, relying instead on instinct and emotional frankness to determine what is right or wrong and who can be considered a friend or enemy. In this instance, Truth becomes a performance strategy designed to test his followers’ loyalty and willingness to believe whatever he says. Truth now becomes synonymous with a regressive tribalism that rejects shared norms and standards while promoting a culture of corruption and what former New York City mayor Michael Bloomberg called an “epidemic of dishonesty.” Truth is now part of a web of relations and world view that draws its elements from a fascist politics that can be found in all the commanding political institutions and media landscapes. Truth is no longer merely fragile or problematic, it has become toxic and dysfunctional in an media ecosystem largely controlled by right wing conservatives and a financial elite who invest heavily in right-wing media apparatuses such Fox News and white nationalist social media platforms such as Breitbart News. Trump has drawn praise from a number of white supremacists including David Duke, the former head of the Ku Klux Klan, the Proud Boys–a vile contemporary version of the Nazi Brown Shirts-and more recently by the alleged New Zealand shooter who in his Christchurch manifesto praised Trump as “a symbol of renewed white identity and common purpose.”[ii] Trump’s use of the term is neither innocent nor a clueless faux pas. In the face of a wave of anti-immigration movements across the globe, it has become code for a thinly veiled racism and signifier for racial hatred. What is needed is also a language of militant possibility and a comprehensive politics that draws from history, rethinks the meaning of politics, and imagines a future that does not imitate the present. We need what Gregory Leffel calls a language of “imagined futures,” one that “can snap us out of present-day socio-political malaise so that we can envision alternatives, build the institutions we need to get there and inspire heroic commitment.” Such a language has to create political formations capable of understanding neoliberal fascism as a totality, a single integrated system whose shared roots extend from class and racial injustices under financial capitalism to ecological problems and the increasing expansion of the carceral state and the military-industrial-academic complex. Nancy Fraser is right in arguing that we need a subjective response capable of connecting diverse racial, social and economic crises and in doing so addressing the objective structural forces that underpin them. William Faulkner once remarked that we live with the ghosts of the past or to be more precise: “The past is never dead. It’s not even past.” Such a task is all the more urgent given that Trump is living proof that we are not only living with the ghosts of a dark past, which can return. But it is also true that the ghosts of history can be critically engaged and transformed into a radical democratic politics for the future. The Nazi regime is more than a frozen moment in history. It is a warning from the past and a window into the growing threat Trumpism poses to democracy. The ghosts of fascism should terrify us, but most importantly they should educate us and imbue us with a spirit of civic justice and collective action in the fight for a substantive and inclusive democracy.